NEW YORK — There are numerous basic flaws in the central piece of “evidence” offered by FBI agent Peter Strzok as proof of his integrity and his lack of bias against Donald Trump during the 2016 presidential election. 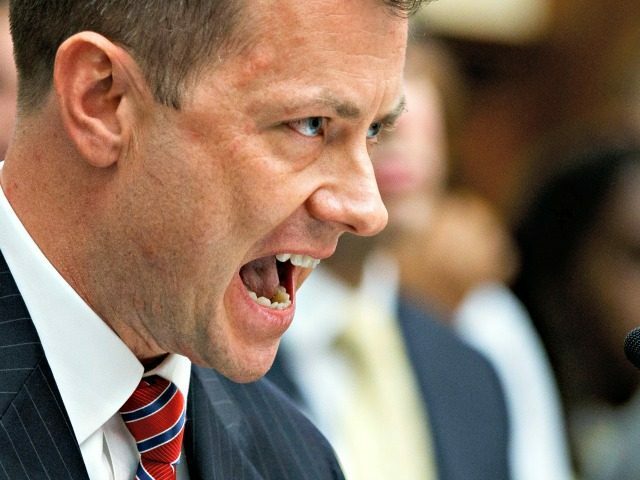 Strzok repeated that same argument at least four times during his hours-long testimony. Democratic lawmakers made the same point in their questioning of Strzok, with one even claiming the FBI agent had a “magic bullet” in his hands to “derail” Trump’s candidacy but never leaked the details. The FBI’s probe of Russian meddling, focusing in part on Trump’s campaign, was initiated in July 2016, but was not revealed officially to the public until after the election took place. Strzok’s claim that his alleged discretion on the Russia meddling probe served as “evidence” of his lack of bias was further brandished by news media outlets. “Peter Strzok just gave a hard-to-rebut defense of the objectivity of the Russia investigation’s origins,” was the title of an analysis piece in the Washington Post. “FBI agent destroys anti-Trump conspiracy theory with ‘one extraordinarily important piece of evidence’” was the title of a piece in the Mirror. Below, in no particular order, are four major problems with Strzok’s claim, each posited by former Obama administration officials. 1 – Hillary Clinton was favored to win so any leak about election meddling would have tainted an expected Clinton victory. In his book Facts and Fears: Hard Truths from a Life in Intelligence, former Director of National Intelligence James Clapper attributes the decision to withhold any public announcement of the Russia interference probe, in part for fear it would taint a future Clinton presidency. The report cited FBI General Counsel Jim Baker revealing internal discussions in which the topic of Clinton’s expected presidential win “definitely came up” and “somebody said something along those lines.” While those conversations were in the context of the investigation into Clinton’s emails, they betray the FBI’s general thinking about how the election was going to turn out. 2 – Obama officials say they were reluctant to expose alleged Russian interference for fear the details would feed into Trump’s repeated proclamations that the election was being rigged. The same extensive Washington Post piece referenced above cited unnamed Obama administration officials explaining that one of the reasons they kept the Russia probe quiet was because any such exposure would “fuel” Trump’s rigged claims. Speaking to ABC News, Comey also said the Obama administration didn’t want to feed into Trump’s “narrative” that the system is rigged. What — you’re right though, with respect to the decision by President Obama, as to how to talk about the Russian interference with the American people. Comey made those remarks during an interview this April with ABC News host George Stephanopoulos. GEORGE STEPHANOPOULOS: And — and all through August and September — there’s a great debate going on inside the Obama administration: What to reveal about Russia (sic) was doing, what to reveal about your investigation. Describe that. JAMES COMEY: Yeah. Not the second part. Y — actually was not a hard question about whether to talk publicly about the fact that we’d opened in — counterintelligence investigations on a small number of Americans because it was far too early. We didn’t know what we had, and we didn’t want to tip them off that we were looking at them. So consistent with our policy — again, very different than the Hillary Clinton case, which began with a public referral. Everybody knew we were looking at her emails. So when we confirmed it three months later, there’s no jeopardy at all to the investigation. This was very different. We did not want these Americans to know that we had reason to believe they might be working with the Russians ’cause we gotta run this down and investigate it. So actually what was debated was a different and harder question which is what should we tell the American people about the fact that the Russians are messing with our election? I also acknowledged to the president that an inoculation effort might accidentally accomplish the Russians’ goal of undermining confidence in our election system. If you tell Americans that the Russians are tampering with the election, have you just sowed doubt about the outcome, or given one side an excuse for why they lost? This was very tricky. President Obama saw the dilemma clearly and said he was determined not to help the Russians achieve their goal of undermining faith in our process.